Out of almost any city I’ve visited, Taipei has to have one of the best public transportation infrastructures in terms of both efficiency and convenience. While the roads can still get pretty jam-packed with traffic – especially with all of the motorbikes riding around – a significant amount of people in the city rely on public transportation. The city’s metro system, the MRT, is extremely clean and almost never late, running from around 6am to midnight everyday. The highest fare runs no more than $2USD, so it’s very affordable as well. There’s also the public buses, which are even cheaper and still very convenient. Like any city, rush hour means it can get very crowded, though this typically will only last several stops. It continues to amaze me that, even when it’s crowded, many Taiwanese people will leave the ‘priority seats’ open for the elderly, disabled, and pregnant passengers to sit. This is an attitude and level of respect that I’ve seen in several other respects here as well and one that is deeply linked to Confucian tradition. Much like the Japanese, queuing to the right side of the escalator and allowing people to pass on the left is also widely practiced here and lets you move at whatever pace you want. In fact, I’ve noticed that, even though Taipei is a relatively big city, people here are still fairly relaxed and not constantly rushing or jaywalking like in other cities. My commute to school each day is about 40 minutes depending on traffic. While this may sound like a lot, it is surprisingly pretty manageable given I only have class three days a week due to the 3 hour once-a-week class structure. I have several options for getting there, though I typically choose to ride the bus directly. This costs between $0.50-$1.00USD depending on which bus I take. With no transfers and some time to kill, I often use this time to listen to music, podcasts, or even do some reading, so it passes pretty quickly. I’ve found that the trade-off for living off-campus is living more directly in the city and engaging with the community in a wholly different way than by living in a school dorm. In this apartment, I have a Taiwanese flatmate with whom I practice my Chinese (in fact, he speaks English well but will only answer in Chinese), a friend from Richmond also on semester exchange, and one other roommate from Europe. Our apartment is located conveniently next to a metro stop, so I can reach anywhere in the city in about an hour at most. This has meant exploring the city has been a lot more accessible on weekends, on top of discovering new restaurants, parks, and other places. Though it certainly wasn’t easy starting off, living like this in Taipei has given me more autonomy and independence than I’ve ever had and has helped me decide what I like most and least about living in a city, my living and spending habits, and other useful information that will teach me a lot after I graduate, too. I’m fortunate enough to have had other experiences abroad where I got to live in both a student apartment and with a host family, so I would say each has its own perks and each gave me different perspectives and insights. I’d encourage anyone studying or traveling abroad for extended periods to look into finding ways to engage with the culture and the community that are somewhat more unorthodox, like taking language/calligraphy/cooking classes and/or finding locals to help you get out of your comfort zone. I think what I’ve realized most of all is any experience like this is completely what you make of it, which is both a heavy responsibility and a fantastic opportunity. People ride mopeds/motorbikes like this all over the city. To make it safer for everyone, there are special rules for these riders to follow, but they’ll still often go beside buses and cars trying to pass! The importance of political activism is not only apparent in conversation, but also in daily public life. There are always small, peaceful manifestaciónes (protests or rallies) going on at street corners, but even more interesting to witness are the big rallies that occur every week in front of la Casa Rosada, a famous government building that contains the President’s office. My classmates and I went and saw the famous Madres de la Plaza de Mayo, a group (composed historically of women) that march in a circle every Thursday in front of la Casa Rosada in memory of los desaparecidos (Argentines that were “disappeared” by the military dictatorship in the late 70’s). Social activism is also commonly witnessed in the streets. Here, a group supports the right to education. I am excited to start taking real classes in Political Science in a couple of weeks when the real school year begins. Hopefully learning about Argentine history and politics will allow me to better participate in the never-ending political discussion that seems to take place here in Buenos Aires! Finally got around to a trip to Malaysia. I was a bit worried that it wouldn’t happen – all but 1 of my flat mates had been before, and the rest of my friends in Singapore were already busy reviewing for finals at SMU, which apparently is a bit of a colossal affair. 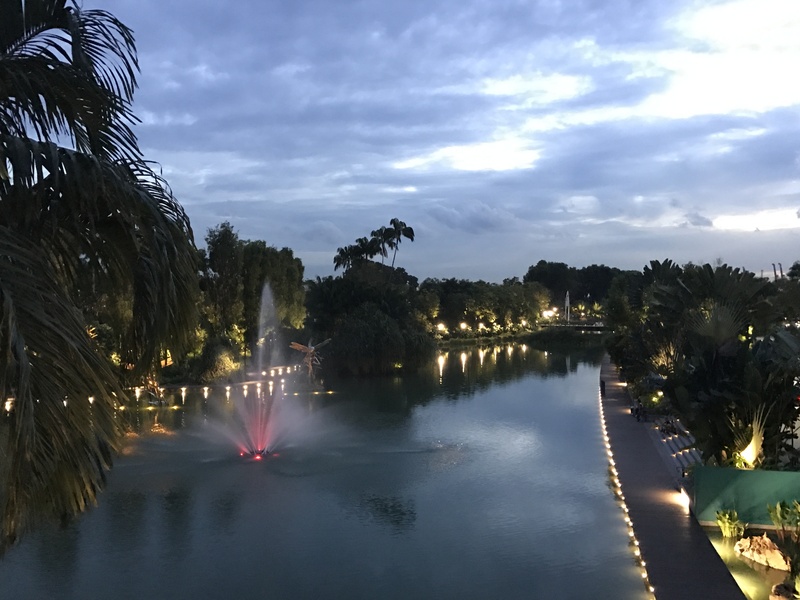 My roommate Loic and I sat down one day and found a three-day period that we were both free of obligations, though, and decided to take a rather spontaneous trip to Kuala Lumpur, the country’s capital. In hindsight, given that I have four finals in a five days as opposed to the usual two week spread, it probably wasn’t a great time to go. But I wasn’t about to go back home after spending a semester in Singapore without a Malaysian immigration stamp on my passport. A view from the bottom of the Petronas Towers. Inside are a series of malls full of luxury brands, like fifth avenue or orchard road compressed inside a city block. The trip was absurdly cheap. I spent just under $120 or 3 days without really worrying too much about my budget, either. Roundtrip bus tickets cost about $30, two nights at a nice hostel were another $30, and the remaining $60 afforded me the opportunity to try anything I wanted from the famous Jalan Alor Street Food Night Market, a 90-minute massage, uber/grab transportation, and a few drinks at the local bar. 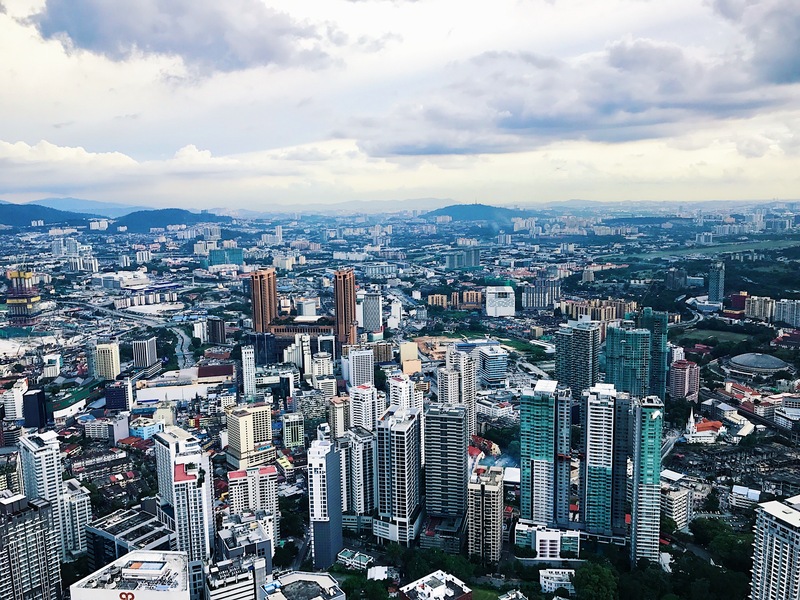 A view of Kuala Lumpur from the top of the KL Tower. It’s no New York, but it’s impressive that you can still see tall buildings in what seems to be miles away from the city center. The hostel was probably the price that shocked me the most, as I expected something much cheaper. My classmates who had taken trips to other Southeast Asian counties like Thailand, Vietnam, or Cambodia, found similar quality or better lodging for around $5-10 a night, whereas even the luxury villa we booked on our earlier trip to Bali cost about $50 for 4 nights for much more extravagant lodging. 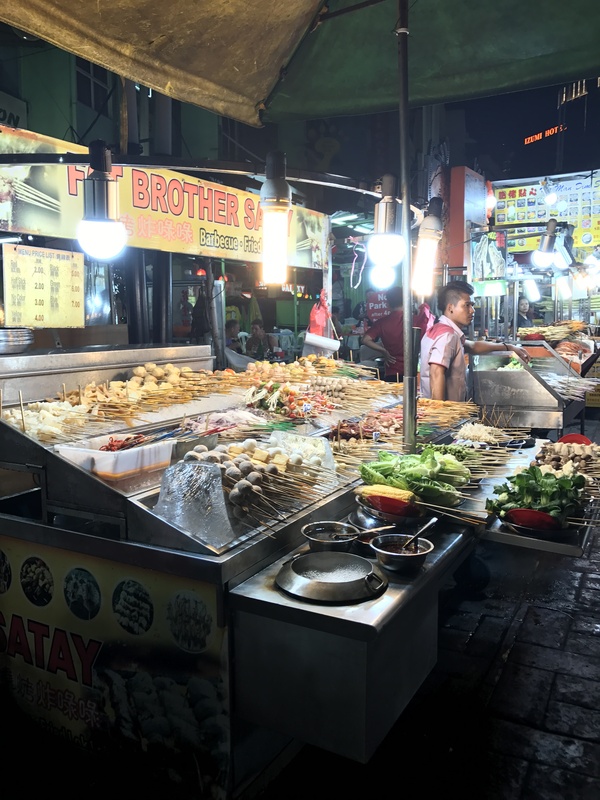 But it was ultimately worth it – the hostel was right in the middle of the food street, and was at most a half hour cab ride away from the sights we wanted to see. One of the many food stalls in the Jalan Alor Food Street. Like in Beijing and Xian food streets, nothing beats the lamb skewers in both taste and value. When Loic and I found ourselves complaining about the price of the hostel as we sat outside the hostel eating lamb skewers and drinking sugar cane juice, we stopped for a moment and laughed at the absurdity of it. Back home, $15 a night for housing, especially of this quality, was nothing. We felt like living in Asia had given us a different conception of cheap and money. It was a realization that my classmates from the first semester and I had, too, towards the end of our stay in China. It’s probably one of the things I appreciate the most from spending so much time abroad – you get a better appreciation of money. If people can live off of x amount, it’s harder to justify spending at the rate you do when you’re back home in the U.S. on luxurious things. 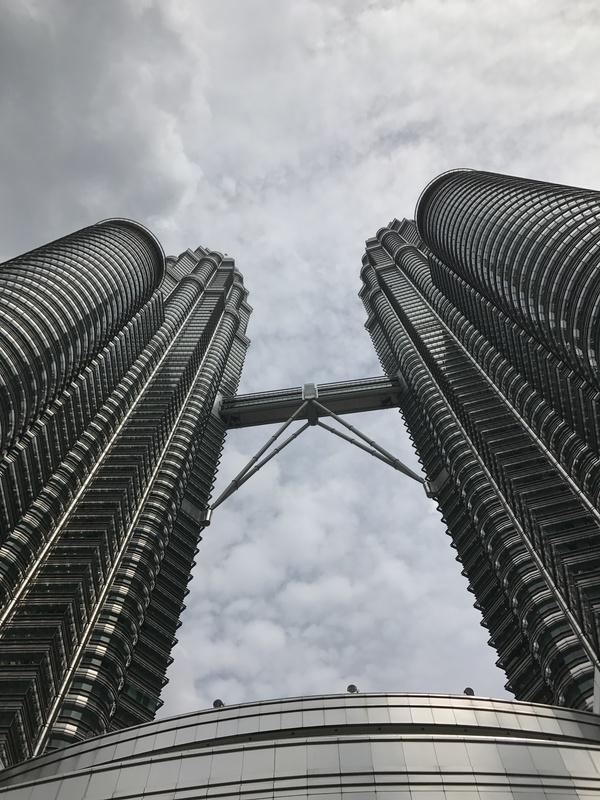 There were five big places that we experienced – the Petronas Towers, the KL Tower, the Batu Caves, and the Sultan Abdul Samad Building, and of course the Alor food street. If TripAdvisor and my flatmates’ advice were to be heeded, these were the must see spots in Kuala Lumpur. The outside of the Batu Caves. There are about 250 steps to get to the caves, with perhaps just as many wild monkeys to greet you on the way up. The towers were absolutely gorgeous, though to be honest it felt like they didn’t fit in their surroundings. What I liked about Kuala Lumpur was that that there was a very nice and not too stark contrast between the old and the new. Like Manila, there were many worn down and dirty buildings, and interspersed among them were newer, cleaner, taller buildings that served a variety of purposes, from government buildings to corporate headquarters to residential areas. But they were never TOO clean, TOO new, TOO tall, so as to be strange – it just seemed like a city that, like many others, was growing up. 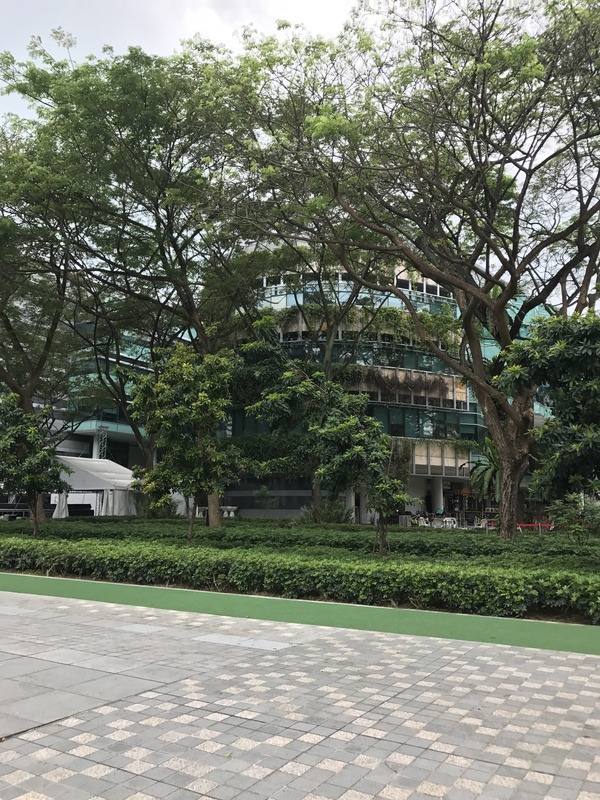 Like Singapore, there was a lot of greenery in the metropolis that helped smooth out the edges of old and new, too. Parks flowed seamlessly into untamed jungle, and this somehow made the abandoned shacks or construction sites next to bank buildings seem natural, too. We were wondering where the lights came from as the inside of the cave was well lit, and we were treated to this view after about a minute or two of walking inside. But the Petronas Towers were just… too different. It wasn’t just the fact that the Towers (and the 30m shorter KL towers) were over 100m taller than the next tallest buildings, though that definitely played a big role. There was something about how the towers looked that made it seem distinctly not-so Kuala Lumpur. Its metallic silver color and the layered outside texture gives it an almost violent feeling that makes it seem like a ripple in the much more relaxed and low-key set-up of the rest of the city. Maybe that’s why it’s such a famous building – not just for its size, but for the emotions you get when you look up from the earth in Kuala Lumpur and see something so alien. The KL Towers, unfortunately, didn’t impress quite as much. It wasn’t so much the fault of the building – it, too, is quite tall, standing at 420 meters, though aesthetically it’s quite plain outside of the sphere-like structure at the top of the tower. It was the fault of the view, really. The sky and observation decks of the the tower, which are its main attractions, offered a great vantage point to view the rest of the city. But that was just the problem – there really wasn’t that much to see. Besides the Petronas Towers, most of Kuala Lumpur’s skyline is quite unimpressive, though it was surprising to see just how far out the city stretched. The view, though, did cement the contrast that I talked about previously – sometimes you would see two buildings next to each other that looked identical, only one was a cleaner, newer, and taller version of the other. 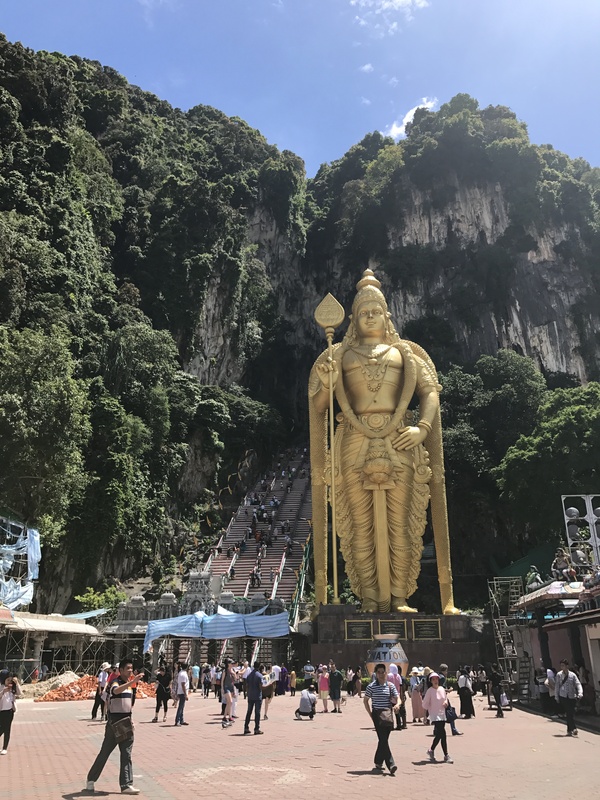 The Batu Caves were the the highlight of the trip, for sure. The site’s main attraction is the series of cave and Hindu temples inside. 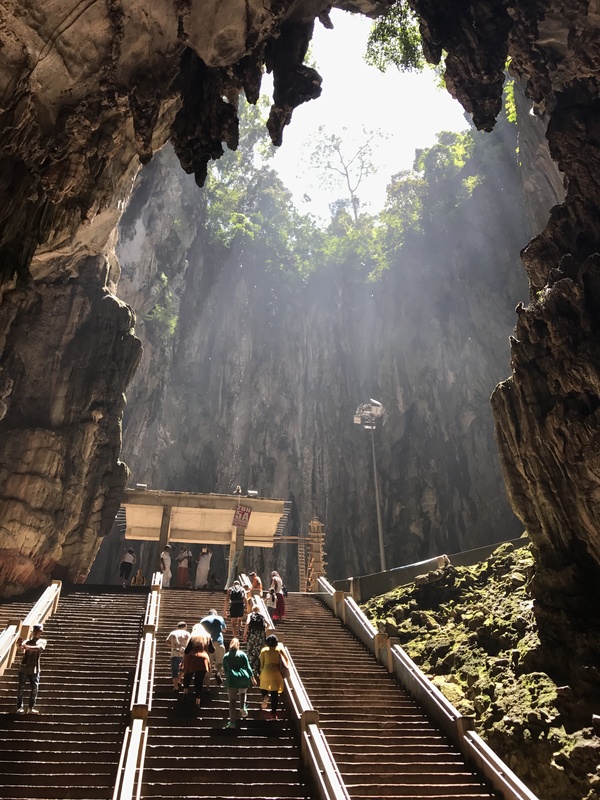 When my flatmates who had been before talked about it, it sounded like they weren’t too impressed: they said they didn’t really understand the religious significance or what was so impressive about a bunch of caves. To be honest, I don’t either – it seemed just like any other Hindu temple that I’d seen. But it’s one of those things where once you walk up the stairs, past all the wild monkeys eating fruit and drinking from bottles left behind, and into the damp, naturally light caves and see the monuments and altars scattered around, as if they were just left behind by their creators, there’s a really strange and almost magical feeling you get inside you. This place just seemed so remote, so far away from society, so serene – and especially in contrast with the hustle and bustle of Kuala Lumpur and Singapore, the moment of quiet is special. The Sultan Abdul Samad Building. Currently under renovation, so we couldn’t go inside – but the outside served for a good enough background photo. 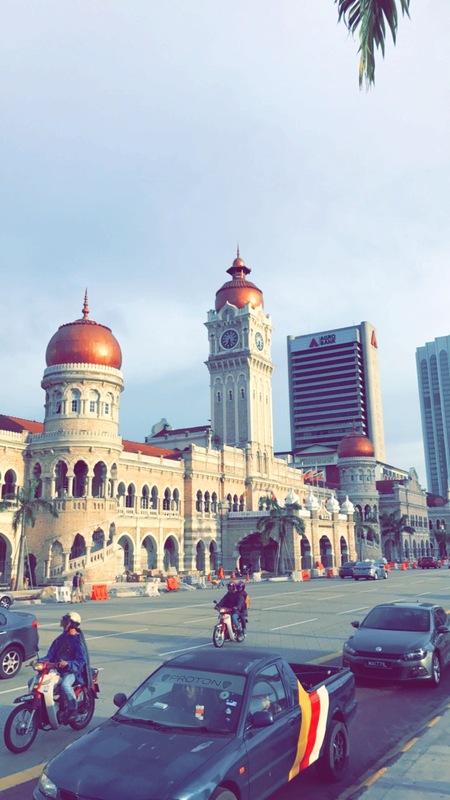 The Sultan Abdul Samad building was just a pretty thing to look at, to be honest. We didn’t spend much time there at all, but my flatmate and I did end up relaxing in the green just across from it. It had a very country club feel to it – there were a few fancy restaurants and a beautiful white marble forum right next to it – but somehow, there were very few people in the green itself, even though we were there during what I would imagine to be peak hours, just after people would start getting out of school or work and just before it got dark. A really interesting place. I don’t think Kuala Lumpur is a must-visit by any means, but I’m really happy I made the trip out . 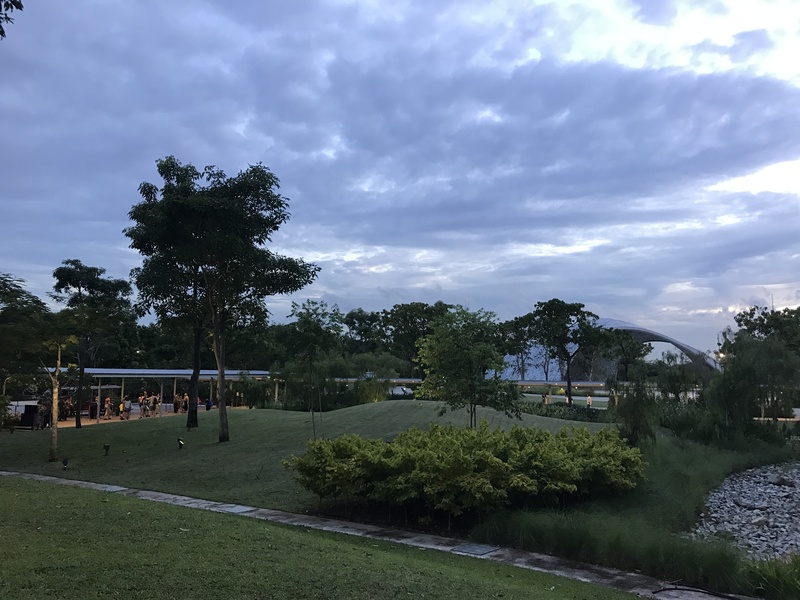 It feels a little strange writing about my “feelings, anxieties, or excitements” about studying abroad in Singapore when I’m already three and a half weeks through my semester. Singapore Management University (SMU) has this strange schedule where exchange students are encouraged to attend a student orientation on December 29, and classes start as early as January 2, so while many of my classmates were still enjoying the final trips of their study abroad programs or tucked into their comforters back home, I was already on the other side of the world, roaming the streets of Singapore looking for a hostel that had open beds on New Year’s Eve. Then again, it’s still quite early, and the first three weeks have really been a frenzy of getting my immigration formalities done, attending student orientations, adding and dropping classes, and of course, turning my new flat into a something that resembles home. There hasn’t really been a lot of time to “feel” or “be anxious.” Writing this entry feels like my first real opportunity to reflect on what’s already happened and what I think will happen. I spent my last semester abroad, too, in Beijing. 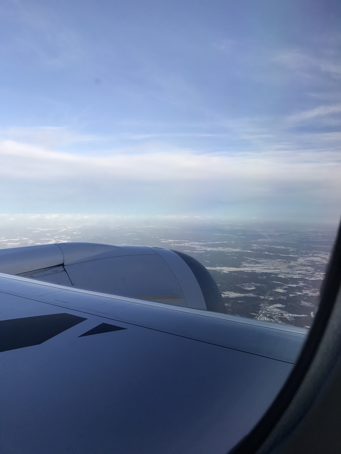 When I hear about study abroad, usually I hear that students will do significantly less work than they do back home, spend a lot of time traveling or exploring the city, and generally have a lot of time to relax. In a way, it’s a lot like a vacation to another school. My experience was the exact opposite. I participated in a language immersion program that required me to speak Chinese on weekdays, and classes were from 8:30 to 4:30 daily, and each of us in the program did at minimum 3-4 hours of homework and studying each night. Somehow, there was still ample time for most of us to enjoy the semester and bring home stories that weren’t just about being locked up in a classroom. We still managed to explore Beijing, travel all over China, experience the Beijing nightlife, and even fall into study abroad romances. It was a complete semester, but it definitely came at the expense of sleep. By the end, many of us sported the deepest eye bags we’ve ever had. I expect that a semester at SMU will be more of the “traditional” study abroad experience. I’m only taking four classes (7-12 hours of out of class work rather than UR’s “10-15”), and they’re all on Mondays and Tuesdays, so I expect I can use this semester to sleep in to catch up on all the sleep I missed in Beijing. Given my five day weekends and Singapore’s proximity to many of Southeast Asia’s tourist destinations – Bali, Vietnam, Thailand, or even a trip home to the Philippines – I wholly expect to drain my bank account by the end of the semester taking flights out to a few of these places. For now, though, I plan on figuratively walking every street in Singapore. 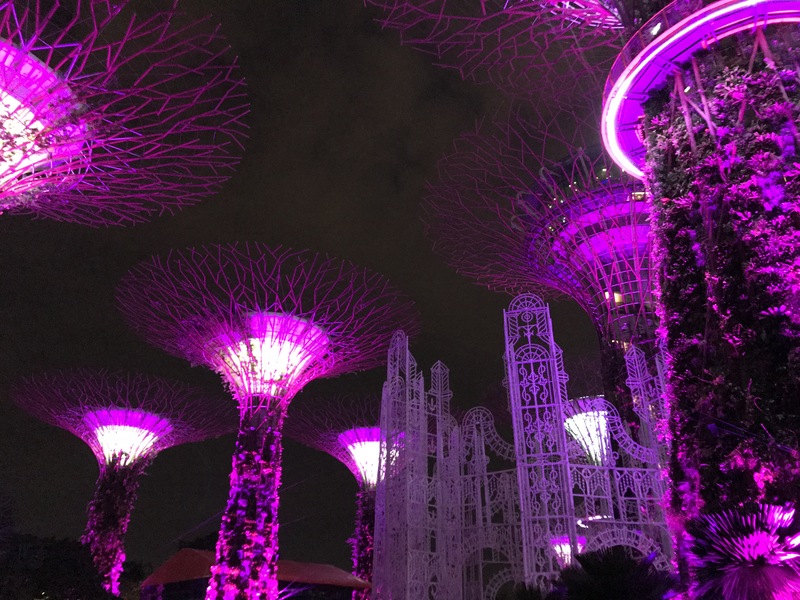 Strangely enough, a lot of students who study abroad in Singapore say that their biggest regret is not exploring Singapore enough, because the presence of all these other destinations makes the city-state a practical home base, and something that you can always say “next week” to, until there aren’t any weeks left. It’s only a little bit bigger than Manhattan, so the process shouldn’t take that long. Anxieties. I think, given that this is my second semester studying abroad, that Singapore is often described to me as “An Asian New York,” and that I’m used to moving around a lot, I don’t have the usual fears of culture shock or “will I fit in?” or “will I find my group of friends?” Instead, I’m worried about people back home. A semester away isn’t too bad because just about everyone does it at some point. Two semesters, however, seems a bit too long, especially since I spent the holidays in the Philippines instead of New York. It’ll be a full year before I’m back in the United States. I already feel myself losing contact with many of my friends, even close ones. But that’s something I should worry about after Singapore, I think. For now – enjoy the semester to its fullest. Olivia in Sweden: Abroad at Last! Hi! I’m Olivia and I am a junior at University of Richmond. I am majoring in Biology with a minor in Healthcare Studies. I’ve never been to Europe before and, as the baby of the family, never experienced much independence either. I set out to form new experiences by studying abroad in Uppsala, Sweden. Uppsala University is a leading international research university, and I was anxious to join its numbers. Postponing the inevitable of being alone in Sweden, I was joined by my mom and aunt in Uppsala on January 11th. This was a sneak peak of my new home from the window of the airplane. Frozen ice and snow never looked so appealing! Before I could move in, I had to explore Stockholm with my family. 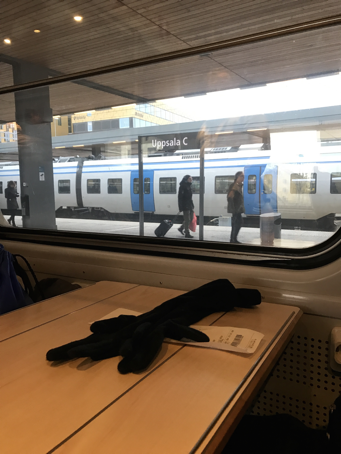 On a train, Stockholm is only 40 minutes away. 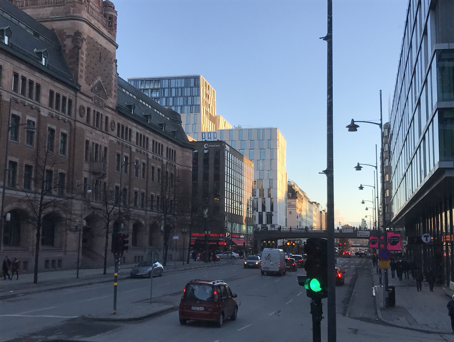 This is one of the many busy streets of Stockholm. We went on a Hop-On Hop Off, which is an all day bus service that provides tours of cities. My mom and aunt were too tired to explore the royal palace, libraries, and museums of Stockholm, but I imagine since the city is only 40 minutes away, I’ll be back soon to explore properly. This is a peak into my room. 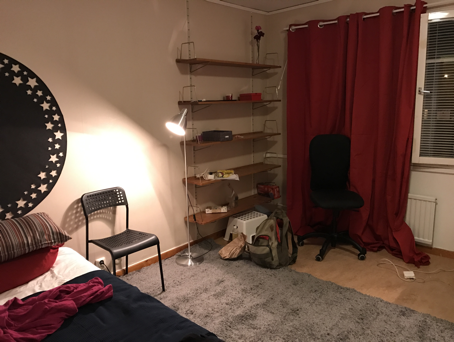 At Uppsala University, the rooms for students are owned by different housing companies. You pay rent each month. It is typical to have a single room with each room having a private bathroom. Each hall shares a kitchen. Classes started this week, and while many people feel comfortable biking (in icy cold weather!) I prefer the bus. 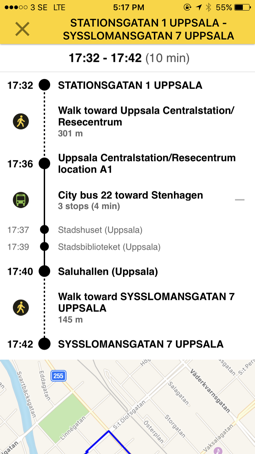 The city buses in Uppsala are extremely punctual. They have an app that provides timetables, and if you enter your location and where you wish to go, there is always a bus ready. While it’s simple enough, I’m still getting used to it as I have fallen victim to being at the wrong bus stop many times! Alas, practice makes perfect, right?